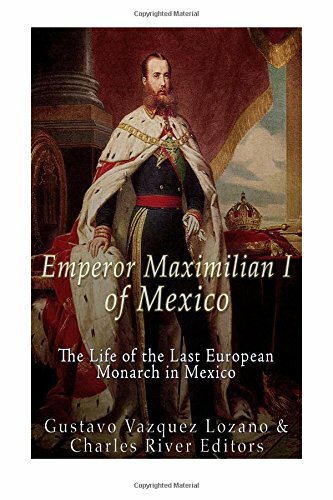 *Includes pictures *Includes accounts written by Emperor Maximilian and his wife of their lives and reign in Mexico *Includes online resources and a bibliography for further reading *Includes a table of contents Once upon a time, when a Civil War threatened to fracture the US, there was a monarchy south of the Rio Grande. That kingdom was called Mexico. It had a magnificent castle, a beautiful princess and a tall, handsome prince; he was noble and idealistic, he had fire in his heart, but he was weak and gullible. A fool, some would say. One day, when he was still a teenager, he wrote, "Ambition is like the balloonist. To some extent, the rise is nice and he does enjoy a splendid view and a vast landscape. But when he rises more, vertigo occurs, the air becomes thin and the risk of a big fall increases." With this parable, the Austrian Archduke Maximilian of Hapsburg inadvertently predicted the destiny to which he would bravely ride, despite the warnings and the sweet talkers. In any case, he followed his heart´s mandate. And Charlotte, the princess, was "one of the most cultured and beautiful" in Europe. Since she was a girl she'd known that one day she would become a queen or an empress. When it was first hinted that they would be offered the crown of Mexico, she was 22 and he was 28, and they were surrounded by the intrigue and ambition of their own brothers, who could not wait to have them removed from the picture. So when, three years later, the couple received the official diplomatic mission which affirmed Mexico required their presence, the proposition was like a fairy tale come true. In the imagination of the era, Mexico was the distant paradise described by the great geographer Alexander von Humboldt: thick jungles and forests, steaming volcanoes, copious gold and silver mines, infinite beaches and exotic birds. "The most dangerous worldview is the worldview of those who have not viewed the world," the Prussian explorer had written, and Max believed it in all sincerity and contemplated the adventure with the eyes of his soul. In Mexico, the reality was different from the imagination. It was too late by the time they realized they had been seduced by sirens, specifically the siren sitting upon the throne of France, Napoleon III. The zealous emperor frowned at the expansion of the US and the Protestant, Anglo-Saxon race. But there were also the vast territories of northern Mexico to consider, the gold and silver mines, plus Napoleon´s vague idea of rebuilding the Latin race and culture in the Americas. With that in mind, he brought two puppets to his global stage, Maximilian and Charlotte, and made sure they were told that the Mexican people would tender unto them a carpet of roses as soon as they saw their royal feet touch their land. In their dreams, Max of Austria and Charlotte of Belgium would become the saviors of the ancient empire of Montezuma, now unable to govern itself, and on the road to self-destruction. But Maximilian was not thinking of conquest and looting, as did his ancestor, Charles I of Spain, but in reconstruction and healing. It is not that he was guilty of arrogance, either. Sending a European monarch to the American continent sounds outrageous these days, but at the time, it was common for the kings of England, Belgium, Greece or Bulgaria to be of other nationalities. Still, Maximilian refused to accept the throne of Mexico until he was shown evidence that the Mexicans agreed. When he was shown a pretend plebiscite, he agreed on the dangerous adventure. The tragedy of Maximilian and Charlotte was romantic and political. In Mexico´s official history, the one recorded by the winners, they were an affront to independence and a symbol of European arrogance. For the monarchies of Europe, they are a sad and embarrassing memory, because of the abandonment, craftiness and treachery they lived through.